Muslim Social Services of Kitchener-Waterloo (MSS K-W) has recognized Wilfrid Laurier University’s Community Service-Learning (CSL) with a University Partner Award. The award acknowledges Laurier’s CSL for its long-standing commitment to giving students opportunities to engage in and develop through MSS K-W’s cultural humanitarian social services. May 2017 marks the 10-year anniversary of the charitable organization. Rebekah Rempel, Laurier’s CSL program coordinator, attributes the award to the community-focused relationship that has been cultivated between the university and MSS K-W.
“These are not just student-placement opportunities, but intentional partnerships that have a lasting impact on both the student experience and the organizations they work with,” says Rempel. Over the last decade, Laurier students from a multitude of disciplines have been involved in the development and delivery of MSS K-W programming for newly arrived youth, child-care supports, computer training programs for adults, and organizational program evaluation. CSL courses at Laurier integrate service in the community with academic content in a variety of courses in arts, science and business. Through service-learning placements or projects at local non-profit or social profit organizations, schools, community centres and social agencies, students fuse classroom learning with hands-on experience. As part of their CSL courses, students are guided through intentional and critical reflections that connect their experience outside the classroom with course material. 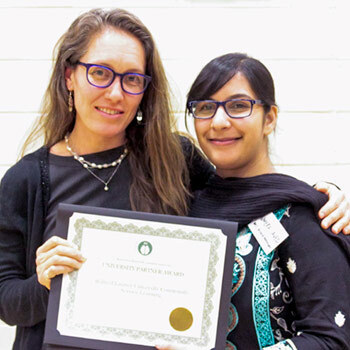 At the MSS K-W awards ceremony in May, Humera Javed, education and inclusion coordinator for Laurier’s Diversity and Equity Office, was recognized with the Excellence in Volunteerism Award. Sydney Marshall and Sarah Best, two outstanding Laurier CSL students who work with MSS K-W, were also in attendance during the celebration. Both students say that CSL placements provide a necessary experiential learning opportunity as part of their student academic experience. Marshall, who graduated from Laurier in 2016, says that professional partnerships built with community organizations through CSL can evolve and remain long after students graduate. “Working in CSL placements, I have had the opportunity to build a network outside of the classroom and gain a better understanding of the field of work that I am most passionate about,” says Marshall.